The amended January 9, 2019 NI 43-101 Mineral Resource Estimate confirms that the River Valley Project has 2,867,000 Measured and Indicated PdEq ounces, with 1,059,000 PdEq ounces in Inferred at a 0.35 g/t and 2.0 g/t PdEq cut-off for open pit and underground respectively. The amended and restated Mineral Resource Estimate presents a Mineral Resource that demonstrates reasonable prospects for eventual economic extraction. The new pit constrained Mineral Resource will be more representative of the potentially economic portion of the Mineral Resource that will be disclosed in the upcoming 2019 Preliminary Economic Assessment (PEA). 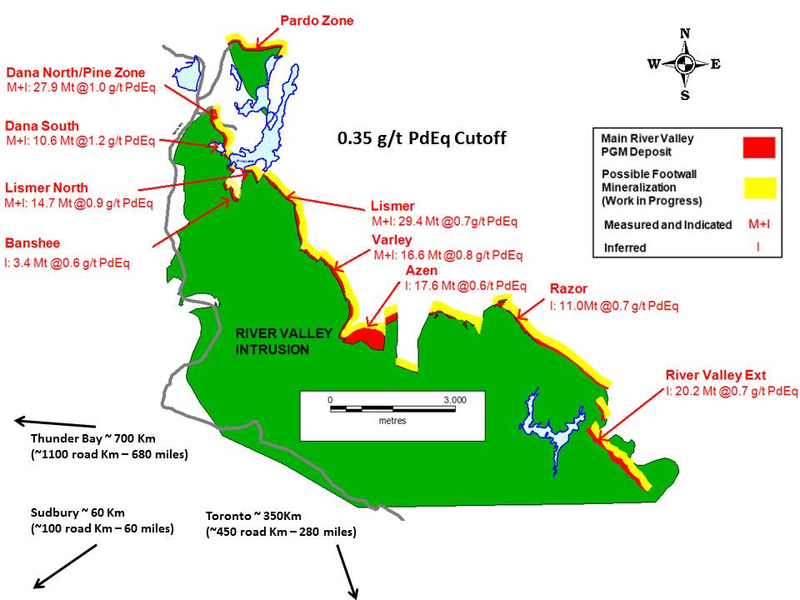 River Valley is the largest undeveloped primary PGM Mineral Resource in North America. The Project has excellent infrastructure and is within 100 kilometres of the Sudbury Metallurgical Complex. The Project is 100% owned by New Age Metals. The Project's first economic study (Preliminary Economic Assessment) is slated to be completed on or before the end of Q2 2019. WSP Canada, under the supervision of Todd McCracken, P. Geo (Manager-Mining at WSP Canada) has recently amended the 2018 NI 43-101 Mineral Resource estimation of the River Valley PGM Deposit in the Sudbury Mining District of Ontario, Canada. The new Mineral Resource Estimate has incorporated all the past data, geophysics, new drilling since 2015 and the River Valley Extension (RVE), including the additional drilling in the new footwall discoveries Pine Zone and T3. The results of the updated Mineral Resource Estimate are tabulated in Table 1 below (0.35 g/t PdEq open pit and 2.0 g.t PdEq underground cut-off). This 43-101 Technical Report is available on SEDAR. Table 1: Results from the amended NI 43-101 Mineral Resource Estimate. CIM definition standards were followed for the Mineral Resource Estimate. A base cut-off grade of 0.35 g/t PdEq was used for reporting Mineral Resources in a constrained pit and 2.00 g/t PdEq was used for reporting the Mineral Resources under the pit. Palladium Equivalent (PdEq) calculated using (US$): $950/oz Pd, $950/oz Pt, $1,275/oz Au, $1500/oz Rh, $2.75/lb Cu, $5.25/lb Ni, $36/lb Co. Figure 1: The Yellow Band represents the footwall potential area of the River Valley Deposit based on the results of the Pine Zone where footwall mineralization was noted to extend 150 metres eastward from the Pine Zone/ T3 main deposit. At present the only area that has confirmed footwall mineralization is in the Pine Zone (defined from 2015 to 2017 drilling). Geophysics and exploration are in progress to test other areas of the Deposit. Management's specific focus is to outline a sufficient potentially economic Mineral Resource in the northern portion of the project, and subsequently develop a series of open pits (bulk mining), crush, and concentrate on site, and ship the concentrates to Sudbury for metallurgical extraction. In late January, our Chairman & CEO Harry Barr is travelling to South Africa attending two 1-2-1 style conferences with over 25 pre-booked meetings with mine finance companies, major mine companies, institutions, stock brokers, and high net worth individuals. If you have not done so already, we encourage you to sign up on our website (www.newagemetals.com) to receive our updated news or click here. NAM's flagship project is its 100% owned River Valley PGM Project (NAM Website - River Valley Project) in the Sudbury Mining District of Northern Ontario (100 km east of Sudbury, Ontario). See results from the most recent NI 43-101 Mineral Resource update above in Table 1. NAM management and consultants are currently designing a complete drill program to be executed in 2019 for the River Valley Project. This plan will consider previously proposed drill parameters and will be based on the most recent geophysical assessment and consultant expertise. The projects first economic study, a Preliminary Economic Assessment (PEA) is underway and is being overseen by Mr. Michael Neumann, P.Eng., a veteran mining engineer and one of NAM's directors. See the most recent press releases for the River Valley Project PEA which details the appointment of P&E Mining Consultants Inc. and DRA Americas to jointly conduct the study, dated July 25, 2018 and August 1, 2018 respectively. Our new Fall Chairman's message can be accessed at our website (www.newagemetals.com) . On August 29, the Avalon report was submitted to NAM, management is actively seeking an option/joint-venture partner for this road accessible PGM and Multiple Element Project using the Prospector Generator business model. The contents contained herein that relate to Exploration Results or Mineral Resources is based on information compiled, reviewed or prepared by Todd McCracken, P.Geo. an employee of WSP and independent of New Age Metals. Mr. McCracken is the Qualified Person as defined by National Instrument 43-101 and approves the content of this news release. Cautionary Note Regarding Forward Looking Statements: This release contains forward-looking statements that involve risks and uncertainties. These statements may differ materially from actual future events or results and are based on current expectations or beliefs. For this purpose, statements of historical fact may be deemed to be forward-looking statements. In addition, forward-looking statements include statements in which the Company uses words such as "continue", "efforts", "expect", "believe", "anticipate", "confident", "intend", "strategy", "plan", "will", "estimate", "project", "goal", "target", "prospects", "optimistic" or similar expressions. These statements by their nature involve risks and uncertainties, and actual results may differ materially depending on a variety of important factors, including, among others, the Company's ability and continuation of efforts to timely and completely make available adequate current public information, additional or different regulatory and legal requirements and restrictions that may be imposed, and other factors as may be discussed in the documents filed by the Company on SEDAR (www.sedar.com), including the most recent reports that identify important risk factors that could cause actual results to differ from those contained in the forward-looking statements. The Company does not undertake any obligation to review or confirm analysts' expectations or estimates or to release publicly any revisions to any forward-looking statements to reflect events or circumstances after the date hereof or to reflect the occurrence of unanticipated events. Investors should not place undue reliance on forward-looking statements.